The Sidhe empire is composed of thousands of worlds, controlled by a vast bureaucracy. It’s an interstellar empire, Pax Britannica (the British Peace) writ large and it has existed for millennium. Its center is the planet Earth, often referred to as ‘Old Earth”, where the Queen and her court reside. Here’s a sample of worlds and potential origin places. Use one of these as an origin place for your character …or write your OWN world. Note: Asil Ares approves new planets before they’re published for game-play. Ours is an ALTERNATE history; what came before? Dairy: The heartland of the Empire’s food production, Dairy’s plains have nearly all been converted into fields. Large barns dot the landscape, more often than not surrounded by fields of cattle, goats, or sheep. It is also the home-world of more than a few current and veteran soldiers, who saw service as a way to escape the everyday tedium of farm life. Many of the Hulda have settled here, loving its wide rivers and fragrant valleys. Its capital city is Audhumla, in honor of the sacred cow who crafted Old Earth at the dawn of time. [Old] Earth: The home-world of the Sidhe and the Human races. [In form, not unlike the Earth we know.] The bureaucracy of the Empire is here, along with the Queen’s court in Buckingham Slithen. Ferrachil: A world covered with lush green, from pole to pole. The majority of the flora and fauna have proven quite difficult to reproduce in captivity, leaving it largely untouched by fae or human hand. There are mysterious caves that are found at the bottom of ravines found throughout the world, from which an impassably strong wind emanates. On occasion, people have heard whispers on these winds, and “ferrachil” seems to be the most common of them. Mechtopia: Technically, the world is known as “New Pendlewik”, and it was licensed for colonization under that name. Nobody calls it that. It is an Earthlike world of no strategic importance that became the private preserve of a wealthy Sidhe family known as the Tuatha de Winchester over a thousand years ago, and remained so until two hundred years ago when the Lady Winchester, the last living member of the line, vanished without trace. Mechtopia is best known for the clockwork cities that dot the pastoral landscape. The most elaborate and famous of these cities is the capital, Mechtropolis. The cities are wonders of engineering, each building is made up of one or more separate modules which can be resized and shaped, rotated, raised, lowered, or even moved to a different part of the city according to the whims of the Mayor. The “streets” are strips of conveyor belts, the center strip moving the fastest, stepping down in speed the closer to the edge you get. NeoVictoria: Mostly a water planet, with islands of civilization. Neo is at the edge of the Empire’s territory …a backwater …it holds no strategic importance and is, perhaps, almost forgotten. There are places like this …places where people who can’t work within the framework of civilization exist. 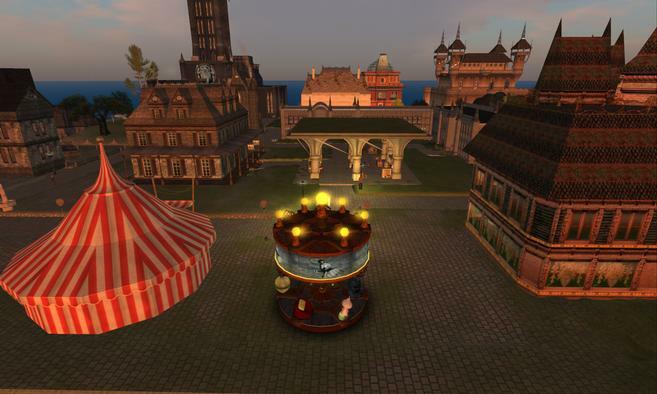 NeoVictoria is the planet we roleplay on in SecondLife! New Edinburgh: Colonized by people from the highlands of Scotland on Old Earth. An ocean world with few large landmasses but thousands of tiny islands. The northern islands are famous for their metallic forests. A large island in the Southern Hemisphere is home to a large fleet base. The largest and most important in the sector. Nearby Islands are used for training, weapons testing and secretive research facilities. Revai VIII: A prison planet ruled by vampires, who often feed on their prisoners publicly as punishment and a demonstration of their power. The planet is massive, but rotates so slowly that one side continually faces the sun and the other is enshrouded in eternal night. The Strand Worlds: Founded by a human general of the Empire named Juricus, the Strand Worlds began in secret (an experiment in democracy). When Juricus was assassinated, the secret was revealed and one of the most devastating wars in the Empire’s history began. The Strand Worlds held abundance beyond imagining, planets that were engines of food production as well a planet (Garith Rock) that contained all the mineral and metal resources necessary to build a war machine that challenged the Empire’s hegemony. Populated mainly by humans and renegade sidhe, the Strand artisans created the first generations of self-aware machines. For a complete history, read The Strand War Concordance on the community website. Tarlec: A a small, Mars-sized planet that orbits a red dwarf star, shrouded in veils of interstellar dust, far out on the frontier of the Sidhe Empire. Covered in a yellow-orange coating of sand and silt, interrupted occasionally by vast mountain ranges of dense gray stone, it is an inhospitable place. It has no open bodies of water, no glaciers at its poles, and nothing green grows there. Its days are hot and its nights are terribly cold. The planet was settled by the Imaja roughly 60,000 years ago;their empire fell around 2000 B.C., leaving Tarlec as their only remaining planet. Imaja are a reclusive race of self-made, practically immortal, animal-headed humanoids shaped in the likeness of Egyptian deities, They are most of the population, though there are some settlements populated by other species: these include humans, djinn, naga, and the rare, hardy thereanthrope. It is through these communities that most of the trading is done with other worlds. Thracia: A small planet, located in the Andromeda galaxy. Strategically it’s near enough to Old Earth (the seat of the Queen and her court) to be an easy hop for an extended weekend, but far enough away to be a serene retreat, relatively unaffected by royal politics. The planet is orbitally locked, so that one side always faces the sun and the other is forever in darkness. Thor’s Hammer: Named for one of the dead gods of old, this rocky planet is sparsely populated save for a few mining outposts. Violent thunderstorms are frequent, so the majority of most towns are at least partially underground. The stone holds a valuable resource, so the planet is one of the most productive sources of gold in the Empire!